The St. Louis Blues finished with an impressive 107-point season in 2015-16. It all sounds fine and dandy, but the big question mark in many people’s minds is the same one we’ve been contemplating when it comes to the San Jose Sharks. Do they have what it takes for the playoffs? This year was a season of injury for the Blues. Losing over 100 man-games due to numerous stints on the Injured Reserve. Most notably were Brian Elliott, Alex Pietrangelo, and Jaden Schwartz (who was out after just 6 games played back in October). The plus side to these injuries (among others), was that each player came back from their trip on the IR, playing even better than they were before they were hurt. The return of each of the skaters and the goaltender happened just in time, within the last month of the regular season and leading into the first round matchup against the Chicago Blackhawks. Jake Allen won the job out of the gate this season, but he and Elliott went back and forth again this year, but this time because of individual injuries. After Allen was sidelined for the second time, Elliott was the starter once again on March 19th. From there, he won 6 of 8 starts and posted 3 shutouts in a row, helping him earn the league’s best SV%and third-best GAA. Elliott started ten games in a row in January before hitting the long-term IR with a lower-body injury. By the end of the season, the team was clicking and Game 1 of the Western Conference Semi-Finals showcased Elliott’s confidence at its highest, shutting out the defending Stanley Cup champions. The Blues’ forwards are deep and well-rounded, but aside from Vladimir Tarasenko, they haven’t been known as a high-scoring team. Jaden Schwartz is a speedy 5’10” winger who didn’t get off to the offensive start he would’ve hoped. Unfortunately for him and the team, he was sidelined for over three months with a broken ankle. Shortly after, centre Paul Stastny went down with a broken foot. When Schwartz was back on the ice on February 12th, he netted a goal and an assist and netted 9 points in his first 10 games back. The speed was missed in the top six forwards, and he was an immediate impact. 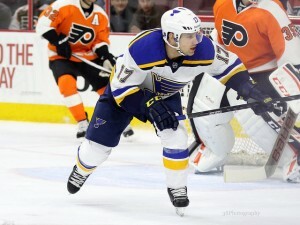 Schwartz finished with 22 points in just 33 games this year. Alex Pietrangelo and Jay Bouwmeester have been mainstays on the Blues’ backend for three years now. Pietrangelo was off to a good start but was hit with his own injury in February. His offensive numbers dipped slightly, but after his time on the IR, he returned with a vengeance. 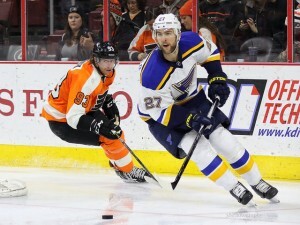 Pietrangelo returned on the back-end to tally 14 of his 37 points through the regular season’s final 16 games. The 6’3″ d-man is easily missed on the team, as he averaged over 26 minutes of ice time a game, 6th in the NHL. When key players who play big minutes are injured, everybody has to sacrifice a little to pick up the slack. We have really good depth and guys that are going to accept different roles in order to win. Everyone has had to do it this year and it’s why you’ve seen us have so much success as a team. Sacrifice is just what the Blues did all season. When Elliott, Schwartz, and Pietrangelo were out, the team still won. Players stepped up and the team won 18 games in February and March while players like Alex Steen were also out with injuries. Team stats also remained impressive, as the Blues maintained a top five PK% all season, finishing 3rd in the NHL. The Blues have some veteran players like Paul Stastny in their lineup but have many players with limited playoff experience. The adversity through the season may have been just what the young skaters like rookies Colton Parayko, Joel Edmundson, and Robby Fabbri needed to be prepped and ready for the post-season. 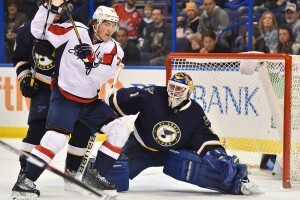 Despite 82-game record, the St. Louis Blues are seen by many as underdogs once again. For the first time this year the entire roster is healthy. They’re riding some momentum from the tail end of the regular season, just in time to be sitting tied 1-1 in the first round of the Stanley Cup Playoffs.